Published by Panzer Tracts, ISBN 0-9744862-6-4, 48 pages, US$16.95. Most WW2 modellers know about the Panther turrets emplaced on steel or concrete bases in Italy and on the Eastern Front, but there was a wide range of other field fortifications with tank turrets. These are distinct from the fixed fortifications of the Westwall or the Siegfreid Line, being intended for use on stationary fronts and in fact reusable by simply detaching the turret and its base plate from the simple wood or concrete emplacement below it, though a lot of them did go to the Westwall so can probably be classed as fixed fortifications. The turrets used ranged from almost standard tank turrets to special versions of them, and French, Czech and Italian turrets were used as well as German ones. This book concentrates on the German ones other than Pantherturms, which are to be covered in a second volume, and Czech turrets. It’s not yet known whether a third book will deal with the other non-German turrets, but we can hope that the team has found information on those too. In this volume we get text, photographs and1/35 scale multi-views plans of the turrets themselves and of the guideline plans for their bases – they were only guidelines because the bases were intended to be varied to meet local conditions. Each turret has a note of known areas of use, with most going to the Eastern Front though many were used in Western Europe. The list includes standard and modified Pz I, II, Flamingo, 35(t). 38(t) turrets and unmodified Pz III, VK 901, VK 3001and Italian P40 tank turrets and here’s enough information to allow you to scratchbuild any of them if you don’t have a suitable spare turret. This book will give you quite a few ideas for diorama bases as well as separate models of the turrets. Recommended. 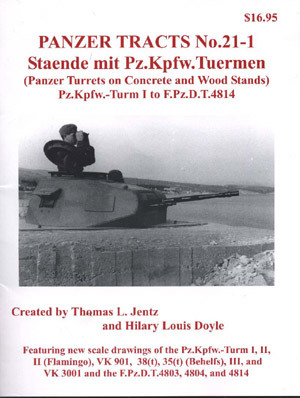 Panzer Tracts are available from most good military bookshops or direct from Panzer Tracts, P.O. Box 334, Boyds, MD 2041, USA, panzertracts@aol.com.